February 2015. It sounds both normal and a little science fiction-y. I'm starting to understand how people get to age 60 / 70/ 80/ 90 and still feel just as they did at age 20. This month, my kitchen has love heart crumpets from Tesco. Oh, I know they are a marketing ploy and of course they cost more than the standard variety. But, Tesco also had Christmas tree crumpets in the lead up to Christmas and I exercised great restraint in not buying them until Christmas week. Sadly, come Christmas week, they were sold out. Sometimes restraint backfires, and so I didn't exercise any when I spotted these. They were into our trolley within seconds and I'm having great fun eating them. In my kitchen there are dark chocolate chips from Sainsbury's. They are dairy free, an exciting discovery given Australian chocolate chips always contained milk (unless you bought the soy-based, vegan friendly variety that cost more). It's nice to know there's a vegan option available for baking. In my freezer, there are packets of frozen corn and edamame beans. I buy frozen edamame beans quite often, but rarely buy other frozen vegetables. However, when a corn craving struck mid-winter, frozen seemed a sensible way to go. In my kitchen I failed at making baked, barbecue-flavoured potato crisps (chips). I managed to burn half while the rest didn't properly crisp up. I may try again, but probably not for a little while! 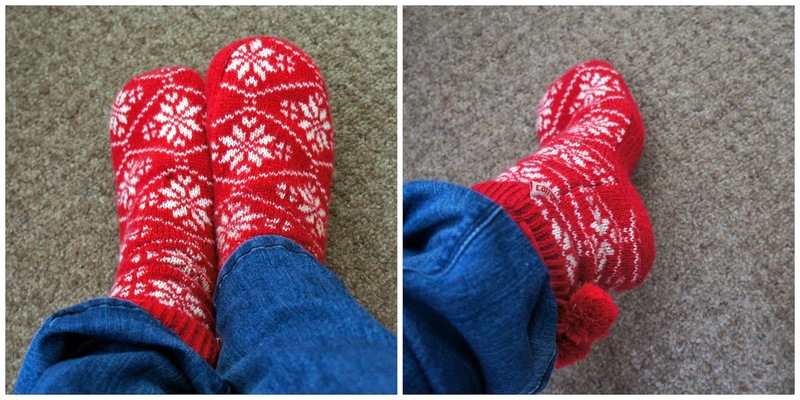 In my kitchen, my feet are often clad in red boot-like slipper socks. They have been a great discovery. Our central heating is generally effective, but the kitchen tiles are still cold! In my kitchen there are too many apples. They are delicious, but I think I may need to put some towards baking. In my kitchen, there have also been repeat batches of the vegan French toast I posted last week. I discovered that tahini plus maple syrup makes for a gorgeous topping. I've also been adding apple slices to the pan whilst the bread is cooking. The whole thing is just so delicious I want to eat it constantly! Last but not least, and in a deviation out of my kitchen, my giveaway of Ricki Heller's new book, Living Candida-Free, closed yesterday. The randomly selected winner is Lisa of I'll Be There With A Fork! Congratulations Lisa - I will get in touch. And congratulations to Lisa! I hope she likes the book!! Hi there! How cute are those crumpets! And I love your slippers... sound like you need them this winter. Thanks for the peek into your kitchen. Hi Kari, I looooove your socks - they are in my favourite colours! I have been looking at the edamame beans recently and wondered how good these are? I have been buying fresh from Tesco but it would be good to have a supply in the freezer for lunchtime salad. Thanks for sharing. Glad you like the socks! I'm loving your slipper socks and the heart shaped waffles in your kitchen this month. It looks very snuggly and cosy - stark contrast to the horrible heat and minimal clothing here at the moment!! Apples just scream out for pie or crumble... or maybe caramelised to add to the top of french toast? I love the sound of tahini and maple syrup - I'm going to try that atop my morning porridge soon! I have been doing impromptu caramelised apples with the French toast, but I like the idea of doing them properly. And also pie and crumble! Decisions! I would not be able to resist the crumpets either. I decorate for Valentine's Day as soon as Christmas decorations come down! The slipper socks look great, kitchen tiles never seem warm enough in the winter! I don't know how the tiles even get so cold, when the rest of the house is relatively warm! Oh gosh...I can just imagine. Dangerous combination! Love your slipper socks. I used to have a pair when I was a kid. I see apple pie in your near future. I think all dark chocolate chips here are vegan as well! And those slipper socks look SO cozy. Pretty sure I need a pair! Such a cute idea to have us 'look' into your kitchen. I love your bowl of apples! I want the heart shapedcrumpets and a pair of cute red and white slipper socks just like yours. Nope have never snacked on frozen corn as a child or adult (though I have had my fair share of frozen peas). Love the crumpets - I would fall for them too. And shame on tesco having tree shaped crumpets earlier in the festive season and not restocking close to christmas! We love slipper socks - they are great to take on holidays in winter when you don't have room for a pair of slippers. Even sylvia has a pair (we have received quite a few as presents). Maybe some apple and choc chip baking ahoy? You may have to try frozen corn now - if you grew up with frozen peas, it will seem quite the treat! I did think Tesco was rather mean for not having the tree crumpets in stock in the very week it mattered, but I'm learning about their ways now. More fool those who wait until the 13th February to buy their heart shaped crumpets! i have always loved frozen peas, not so much corn. the heart shaped crumpets are rather cute. i am sure they tasted better than normal ones. :) love the slipper/socks. Oh, I'd love it if you made some heart shaped crumpets! I had no idea my feet were in the 70s/80s :D They're readily available here in London! I'm definitely happier when warm, that's for sure :-) I'm glad to give you some ideas for the tahini too!